I’ve been very inactive on this blog for a while now (though a lot of great things are happening over at Math Munch (big news to come…)), but I have actually been very active. This blog has been mostly for math/school pontification, but I’ve decided to start posting more broadly, beginning with more mathematical art stuff. To that end, I’m creating an art gallery of my works here on Lost in Recursion. You can click on the Art tab at the top of the page, or you can hover for more specific pages. I hope you’ll click around, because I’ve included lots of images and little descriptive blurbs. I’ll post a few pics below to whet your appetite. Click for more of the same. I’ll continue to add to that section and use it to document and publish my work as an artist. Speaking of which, I’m very excited to be included in the Saint Ann’s Faculty and Staff Biennial Art Show. More on this another day. I’ve also gotten access to a couple of very nice printers which can go as wide as 13″, so I’m excited to start making some beautiful prints of these images I’ve had lying around a while. Here’s your bonus: a fantastic video that Justin put together showing off the three sizes of zome nodes used in our meta-meta-node. Enjoy it all and leave a comment, why don’t ya! My earliest love of mathematics came when I realized its utility in creating beautiful things. As a third grader (and ever since), I spent countless afternoons drawing stars and patterned shapes with a protractor or compass. In my work as a teacher I get to share that beauty in creation with my students. In my art I sometimes try to illuminate the complex structure and interconnectedness of simple, patterned objects. I’m compelled to understand complete spaces of related works and how my choices as an artist locate me within that space. Stars of the Mind’s Sky is the title of a series of works exploring the space of regular star polygons. Here we see 300 stars “in orbit” along concentric circles. The number of points on a star increases with the radius, and stars of a given number of points are spaced evenly along their circle according to “density,” or the “jump number” used in generating them. Algebraically, these represent the subgroups and cosets generated by elements of a cyclic group. 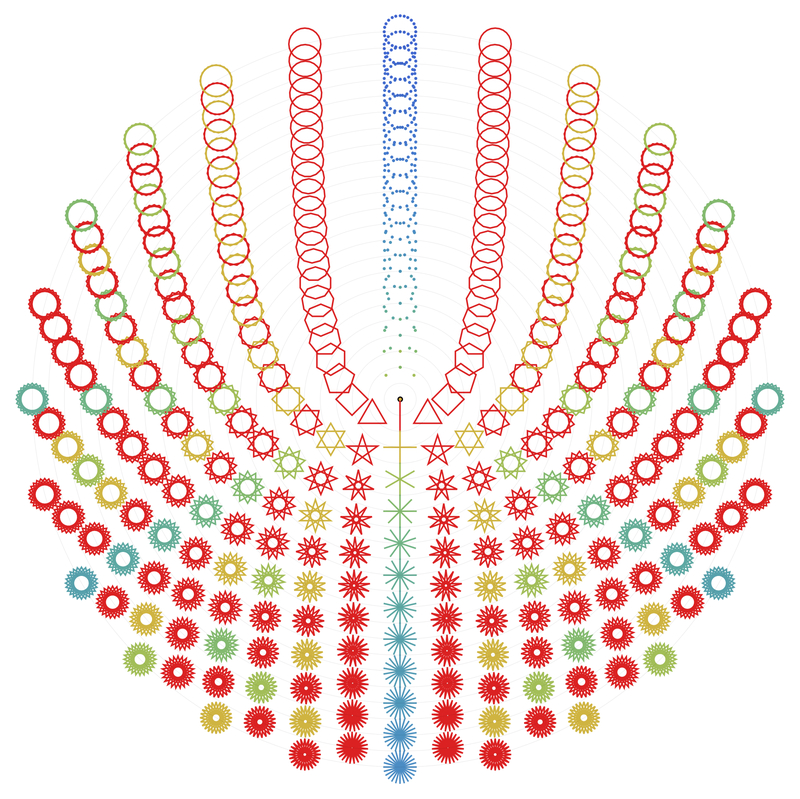 They have been colored on a gradient to indicate the number of cosets; a red star signifies a generating element. As a consequence of these structural choices, we may observe congruent stars with increasingly many cosets, shifting their way to blue along central rays through any red star. We made this as part of our MArTH Madness mathematical art festival at Saint Ann’s. 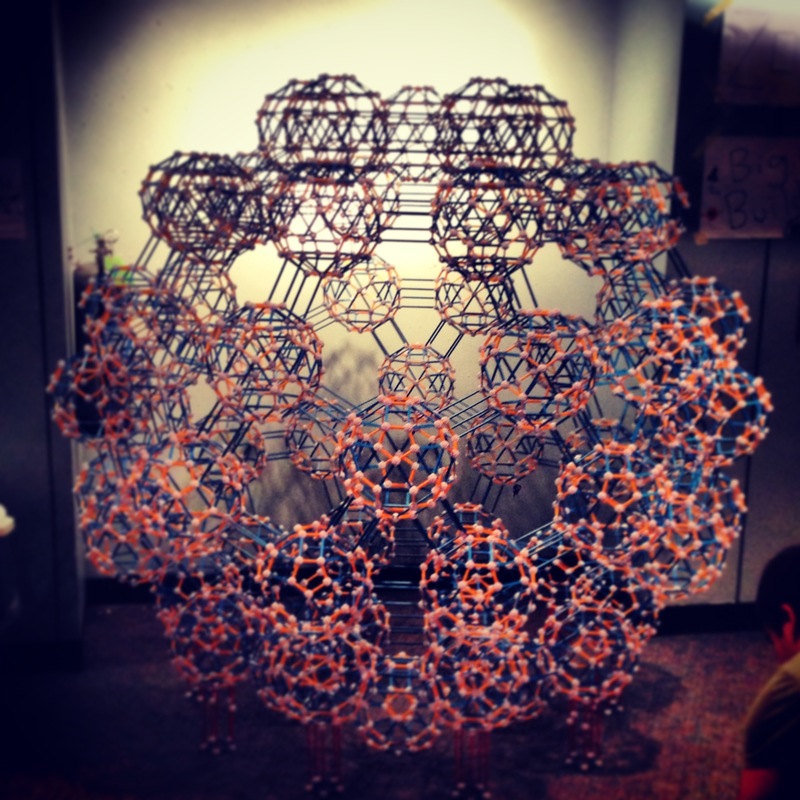 Dozens of students and teachers worked together to build 60 metanodes out of Zome. Then about 15 people worked together to piece them together into an even larger rhombicosidodecahedron. It’s a Zome ball made out of zome balls made out of zome balls!!! It stands about 5.5 feet tall, and its now resting safely in our basement art gallery. 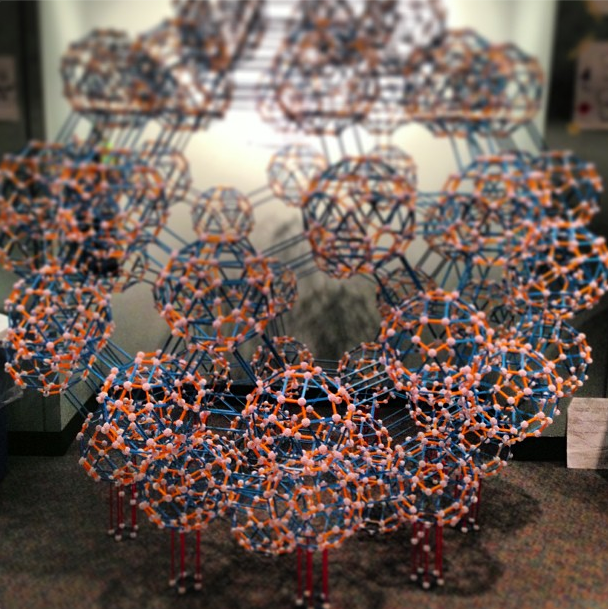 A Zome node made from Zome nodes made from Zome nodes! To actually construct it, we built the top first, and then lifted it to build beneath so that the weight would hold the struts together during construction. In the end we held the dome up and slid the bottom underneath it. Amazingly, it held together in front of a big, cheering crowd. I love MArTH Madness. We’ve been thinking about this model for a while, and to see it actually finished feels amazing. As one student put it, “It’s like we wanted to do it, and then we did it, and now it’s done.” I love that. Update: Justin posted a fantastic video showing the different node sizes. Enjoy!